Thanks again to the tireless efforts of FASF Vice President Roy Mantei, the FASF is once again set up at the local recruiting table. After his successful new member sign-up at the Deming Duck Races only weeks ago, the FASF gathered quite a few new local members. Although the First Aero continues to gain new recruits from across the country and even abroad, there is an urgent need for more local area active members in order to staff the numerous local events in which the Foundation takes part or which they sponsor. The SW New Mexico State Fair began with events on Thursday, October 8 and it runs through this coming Sunday, the 11th of October. 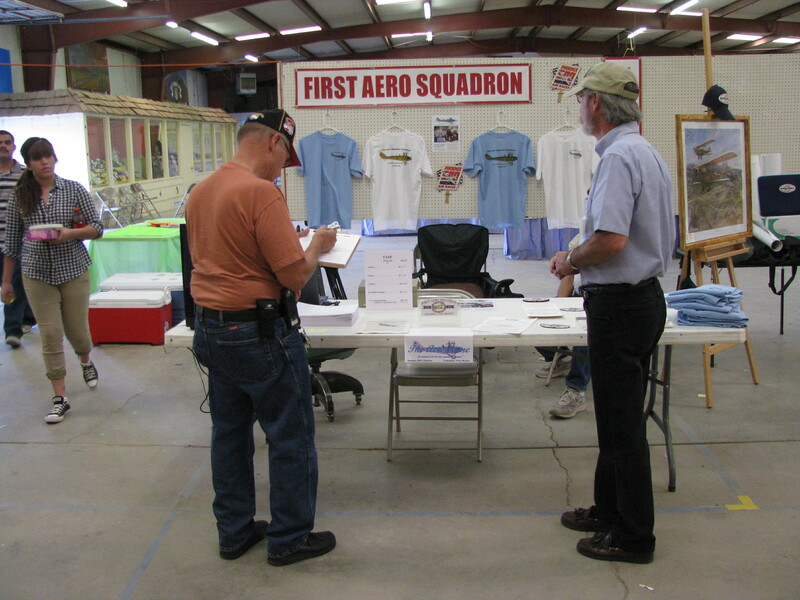 On Thursday, it was thanks solely to FASF member, Richard Orona, that our booth was set up, secured and manned. Without his early help we’d have missed obtaining our prime spot in the Exhibition Hall. Seen in the Aerodrome Staff photos below, all taken yesterday the 9th and today, Saturday, the 10th, you can see the FASF Booth on full display. Although the event didn’t really pick up a full head of steam until today, Roy’s team had already managed to round up some interesting new local area members, some of whom have already volunteered to help in the FASF Mission. 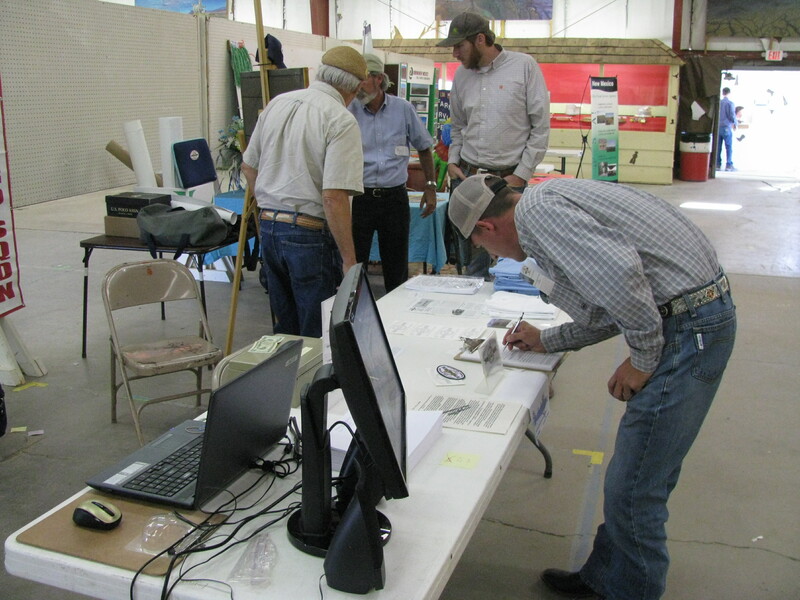 Roy Mantei (Right Above) explaining what took place back in 1916, when the FAS operated its Jennys out of the Columbus Army Airfield, to an interested Deming couple and their three small children. The famous “Two Jennys Over Columbus” painting by FASF Advisor, Peter Westacott, of Great Britain, continues to draw Fair visitor attention and gives rise to a continuous flood of questions. A good number of these fine prints have been sold at the FASF Booth, and, thanks to Peter, have helped raise operating funds for the FASF. 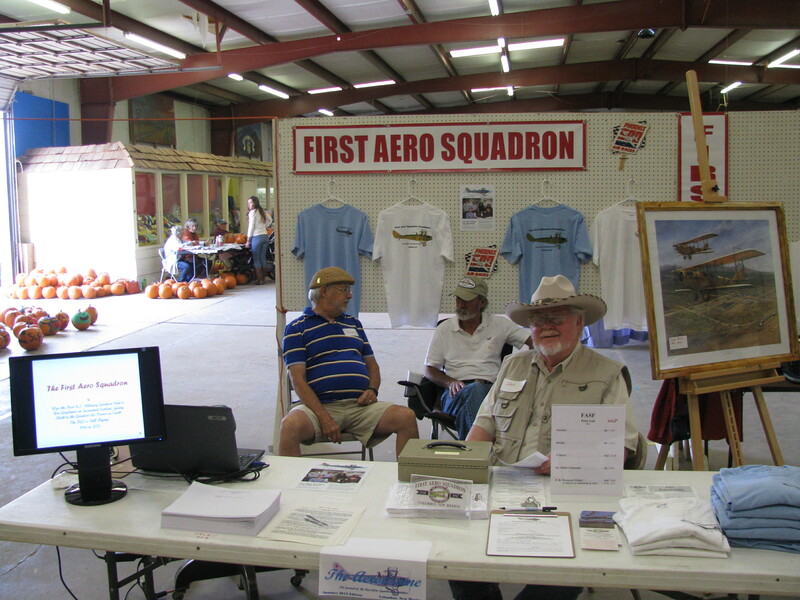 Two recently joined new FASF Members arrive to help staff the Fair booth with Roy. L to R above are Dennis Grier, Roy and John “Doc” Edwards, all of Deming, New Mexico. 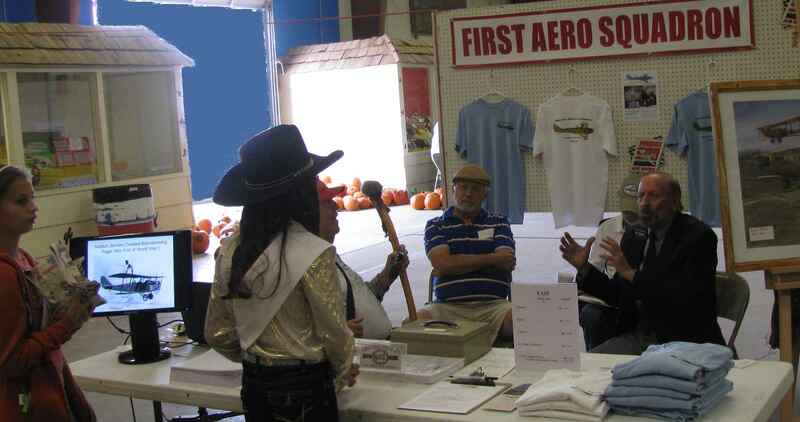 Saturday saw Deming residents like Cindy Jordan take the opportunity to buy an FASF T-Shirt, join the First Aero – and have fun chatting about Columbus and FAS history with Roy and Dennis. 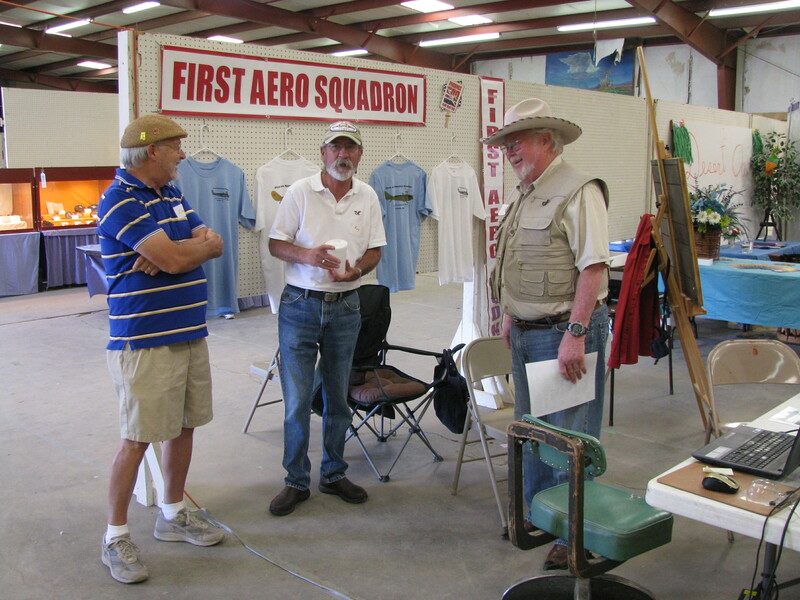 L to R: Dennis, Roy and Doc again captured discussing the FASF’s future plans and the roles they might take to assist. The FASF was lucky that Jim Sullivan of Deming stopped by to join the Foundation. Jim has spent almost his entire working career, aside from his stint during Vietnam in the Navy, working as a forward spotter and strategic advisor in the fire fighting and suppression profession. Here he is describing his exciting career with Roy and Dennis. Dan Sanchez, of Deming, (on left above) was caught by the camera filling out his membership application, as Roy stands by to help. 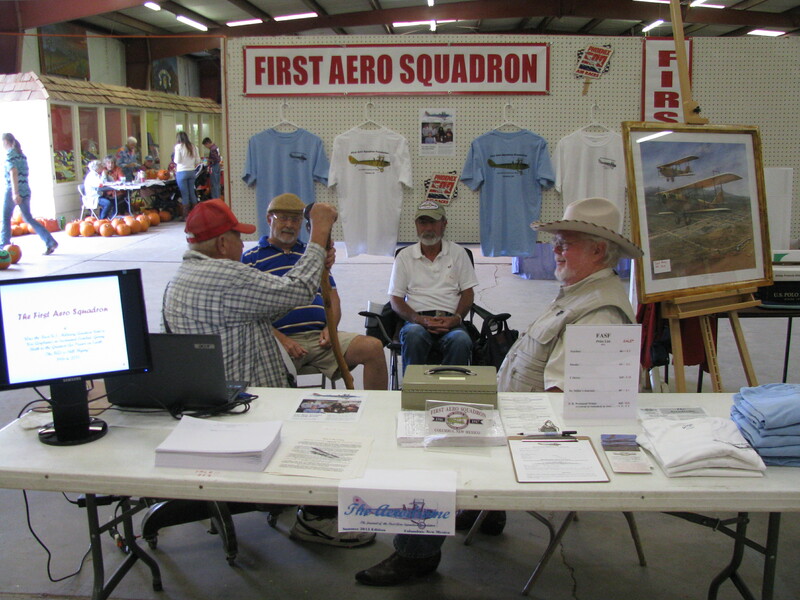 Chantz O’Byrne (right above) fills out his FASF Member application as his friend (in rear) studies the Westacott “Two Jenny’s Over Columbus” Painting with Roy and Dennis. Chantz was born and raised in Animas, NM, now mostly a ghost town West of Columbus. He was given his first airplane ride there as a child from a renown antique aircraft restorer who happened to be his neighbor. 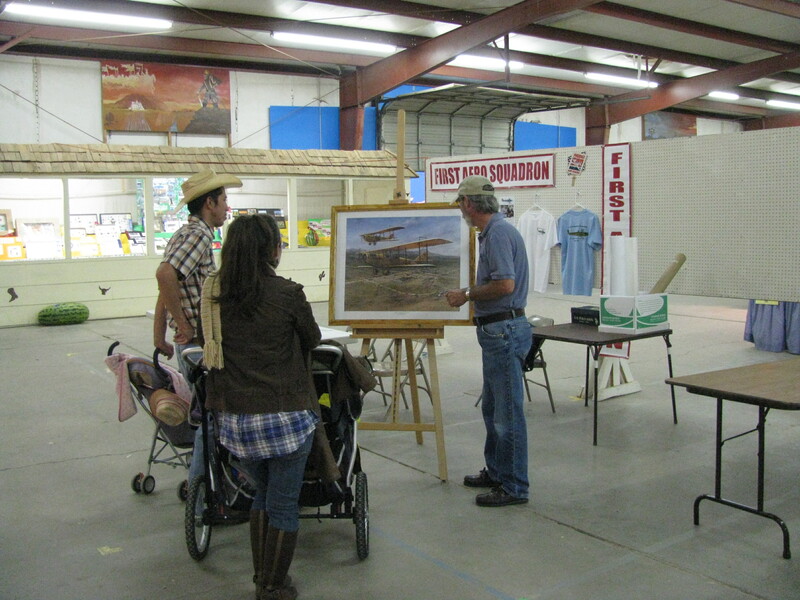 FASF President Ric Lambart, at Right, explaining local Columbus history and the role of the First Aero Squadron 99 years ago, to young Fair Princess, Julianna Marrufo and her sister (at Left). The young girls were exited to hear about the role that women now play in both U. S. Military and Civil Aviation and all about how the old “glass ceiling” that had prevented female involvement in such professions had been shattered not that long before they had been born. 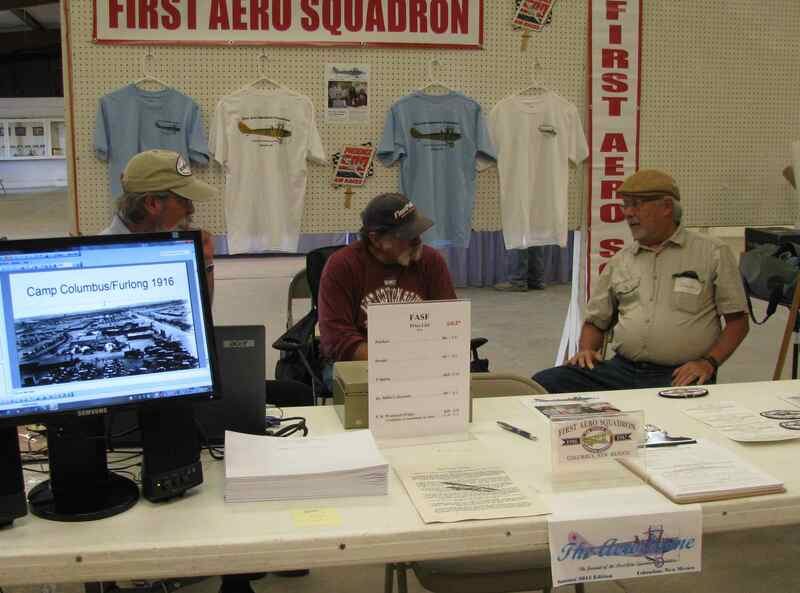 Brand new member, William Fencil (L above), of Deming, who just signed up with the FASF minutes before, sits down to chat with Dennis, Roy and Doc. Roy extends his enthusiastic invitation to one and all who happen to be near Deming and the State Fair Grounds, to stop by and visit at the FASF Booth in the Main Exhibit Hall. The Booth will be fully staffed all the way through this coming Saturday, the 10th of October. This entry was posted in HOT NEWS! on October 10, 2015 by FASFRIC.